Hold that Banner up High! Make and decorate musical notes of the Pied Pipers pipe. Lord Mayor and his paraphernalia! Help to create the sculpture of the Lord mayor & his bike! examine original drawings and models by some of the greatest architects the world has ever seen. Slide show and talk about change in the built environment and how our surroundings have been transformed over the time. Workshop: Looking at the today’s architecture and re‐imagining buildings around us. Come and have a go at making a collage picture! A suggested donation of £2.00 in support of Sprout Arts welcomed. An opportunity for local children,families and school parties to see artwork produced by the KS1 children at Rutherford House School, to view a specially commissioned National Gregraphic film on tigers, and to also get creatively involved in the tigertastic project. All events are at Sprout arts and all children are welcome to join in! This is a two hour course exploring different techniques with watercolour painting. This course will enliven your watercolour paintings and enable you to create work with energy and vitality. Suitable for people who have a little or a lot of experience in this form of painting. Sponge (natural if possible, but if not a piece of man- made sponge). and has exhibited with The Royal Watercolour Society. This is a two hour course exploring different techniques with watercolour painting. This course will enliven your watercolour paintings and enable you to create work with energy and vitality. Suitable for people who have a little or a lot of experience in this form of painting.Participants will need to bring:-Watercolour box, Watercolour brushes, Watercolour paper (one sheet at least 350 grams), Large plate (china or plastic) ,Sponge (natural if possible, but if not a piece of man- made sponge). Maureen Sweeney is a qualified Art Teacher who has taught in adult education and has exhibited with The Royal Watercolour Society. Tuesday 10th February between 3.30pm and 5pm. We will show you how to create your own love design on a salt dough heart. 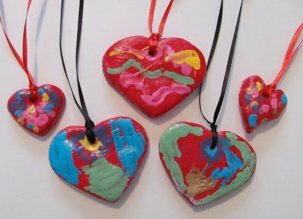 We are sure you will love every moment of this valentines workshop, as you get messy with glitter, fabric and paint! So join us, spread the love and have fun as we prepare for Valentine's Day!